It’s Monday and I’ve got a crazy work week ahead of me, so why not start out with a finished object? 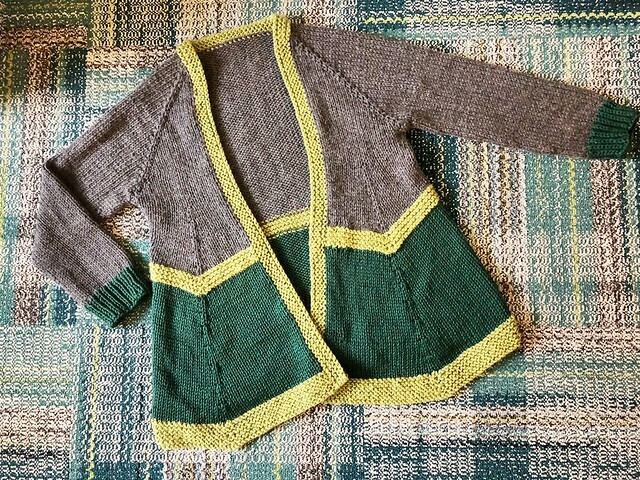 I finished my Bermondsey cardigan for my Aunt over the weekend. 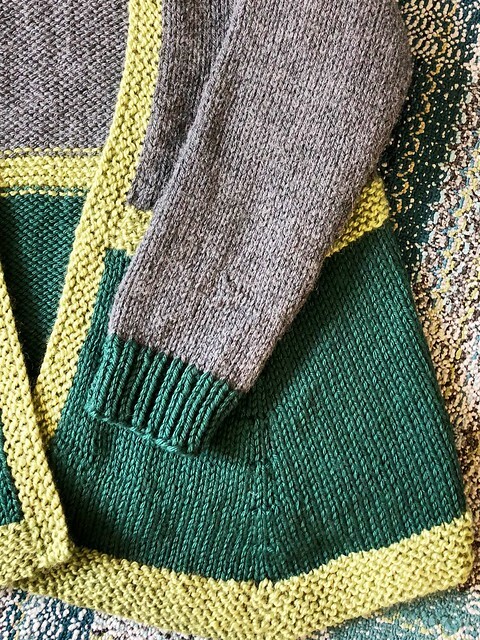 I was originally going to make her a blanket and I bought 8 skeins of Berroco Vintage Chunky, 4 in grey and 4 in green (her favorite color). But then I decided a cardigan would be better for laying around in while you’re recuperating, right? So I decided I’d do a little color blocking but wanted to add a brighter pop to break things up. So I dug into my stash and pulled out a skein of Patons Shetland Chunky in a citrusy green shade. It was just enough of the punch that I needed for this one. I followed the pattern body to a tee but this time I made ribbed sleeves instead of garter stitch ones. You may remember that when I made my black and white Bermondsey my sleeves came out a bit long when I blocked it and I eventually went back and fixed them. Since she’s in Memphis and I can’t easily fix them I figured ribbed cuffs were easier to fold back if too long than garter stitch ones. 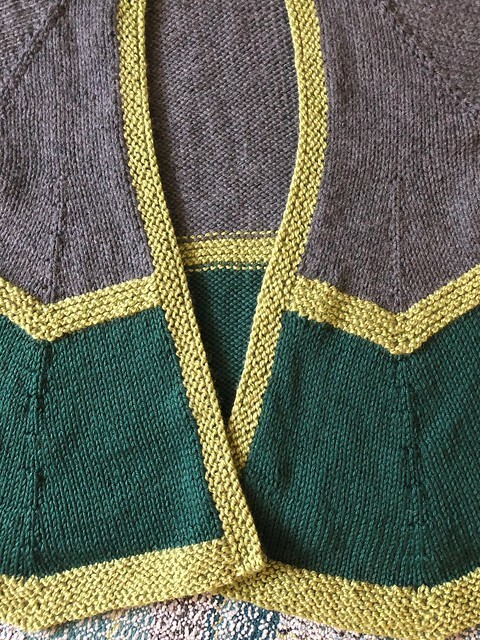 I really do love this cardigan and the fun drape the front panels have. I knit this a size down from what I made myself (I’d say a medium) and since she has a small frame I wanted something that would be cozy on her. I think it will hug her perfectly. I do love how this Vintage Chunky yarn worked up and it washes up beautifully. I didn’t have any fuzzing or pilling and it is so soft and cozy. I’ve still got a few skeins of these colors left and I have 2 other shades in my stash…perhaps I’ll get to make something else with it soon! Thanks! I wasn’t sure at first but liked the end results. ooo good choice! It looks wonderful and she will certainly love to wear it.